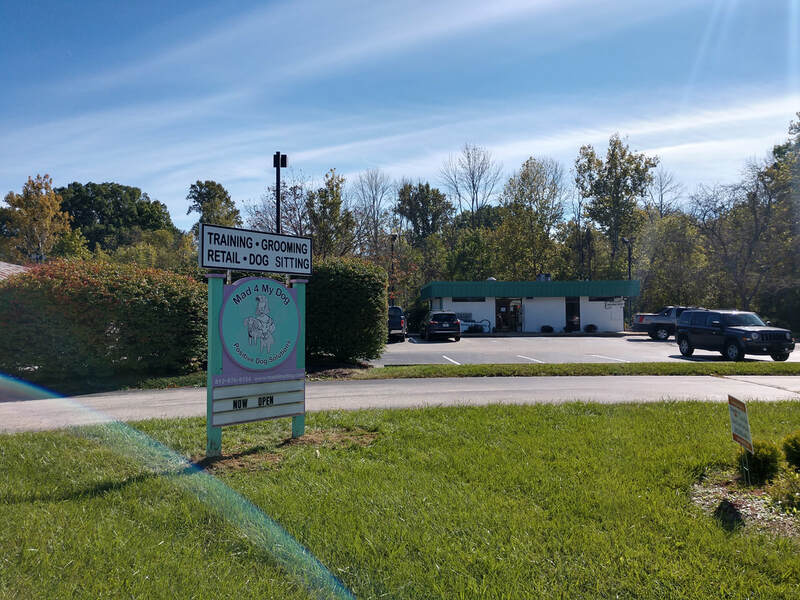 Located on West State Road 46 close to Ellettsville, on the south side of the highway directly across from the Citgo station between Arby's and McDonald's. The building sits off the road a bit, white bottom and green top. Google maps sometimes sends you to the east side of town and this is WRONG!! We are close to Ellettsville. ﻿We will display our OPEN sign when we are available for walk-ins. Grooming and Training are by appointment only. Call ahead at 812-876-8134 if you'd need to come by! Please note: Groomers are only here during open grooming hours when they have appointments scheduled. They may arrive up to 15 minutes before their first appointment of the day; however, they need that time to prepare for the day's upcoming grooms. If you arrive very early for an appointment, there may not be someone here to receive your dog, so PLEASE ARRIVE AT OR ONLY SLIGHTLY BEFORE YOUR APPOINTMENT TIME unless you have made prior arrangements with a groomer or M4MD staff member to do otherwise. Thank you for your understanding.